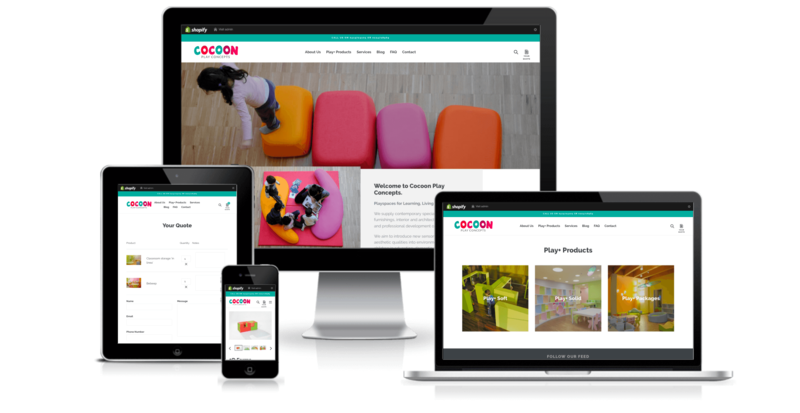 Cocoon Play Concepts are the first representative of PLAY+ furnishings and projects in Australia and New Zealand. Their PLAY+ range provide complex and stimulating environments where children can experience the adventure of learning and explore new ways of inhabiting spaces. Cocoon needed a branding and an online store with a twist: they wanted customers to be able to compile and order sheet rather than purchase directly from the website. The first step with this project was to look at the existing branding and work out a way of invigorating it without resorting to a name change. We did this my developing a brand new wordmark that was fun, youthful and exciting. Next up was the development of a new website with a custom online store experience. We chose Shopify as the platform and set about designing a site that looked great and was easy to use. The end result of our design and development work is a wonderful new brand and a clever online store website. The key to the success of the website is the custom ordering system that we developed. It gives customers the ability to build a list of products that they are interested in and then submit it for quoting by Cocoon. The site has been very successful with orders coming in from new clients around Australia and New Zealand.